To evaluate the efficacy of the PA102C on reducing total volatile organic compounds (TVOC), formaldehyde (HCHO), airborne bacteria and cigarette smoke particulate. The testing of the PA102C took place in a controlled room 1,000 ft3 in size. The device reduced over 70% of TVOC, formaldehyde, airborne bacteria and cigarette smoke particulate (0.5μ – 5.0μ) within 15 minutes, over 80% within 30 minutes, and over 90% within 45 minutes. 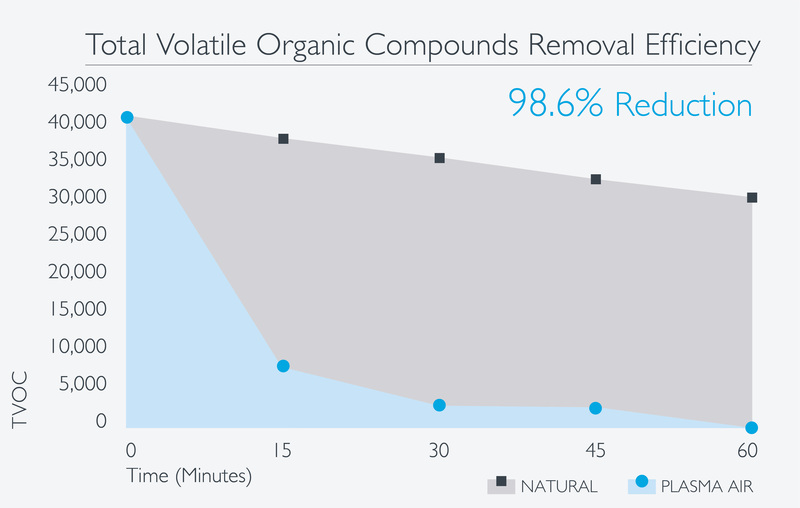 Final results after one hour: 95.3% reduction of formaldehyde, 98.6% reduction of TVOC, 95.3% reduction of airborne bacteria, and 96.3% reduction of particulate.